Welcome to another Artisan Design Team Blog Hop. 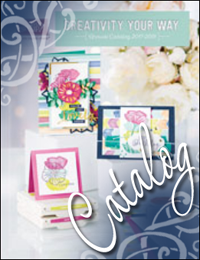 On this hop, we are focusing on the All is Bright Suite on pages 4-7 in the 2018 Holiday Catalog. This suite includes a broad range of traditional colors and imagery. I decided to step of of my comfort zone a bit and make a fun little treat bag as my focal project. I made a simple bag with some All is Bright DSP (#147892) and include a fun little tag stamped with the Making Christmas Bright photopolymer stamp set (#148046). Hint: I used some inexpensive paper shreds from the local dollar store as bag filler. For my second project I used the same tag elements and added everything to a Striped Treat Bag (#144255) stamped with Memento Tuxedo Black Ink and colored with Stampin' Blends markers. It would be really easy to include a simple hand-stamped card and maybe even a gift card as a quick and easy holiday gift for a co-worker or friend. For my final project I couldn't resist making some fun flowers using the All is Bright DSP and the Christmas Bulb Builder Punch (#148013). I love using flowers on almost any project...where there is a will, there is a way! This is a semi-inexpensive frame ornament I purchased from the craft store. I removed the back, covered it with Basic Black cardstock and heat embossed the sentiment from Merry Christmas to All stamp set (#147702) and heat embossed it with white embossing powder. I used hot glue to reattach the panel to the frame.